Are you someone who enjoys assembling jigsaw puzzles? If so, do you top out at 500 pieces, or are you a glutton for punishment preferring 1000+? I’m not a jigsaw fanatic, but I enjoy working on a good puzzle every now and then. My favorite moment in the puzzling process occurs when I finally locate a piece that has been eluding me, setting off a string of easy matches. My mother-in-law loves puzzling, and has framed a couple of the beautiful puzzles she’s completed over the years. When we were at the Grand Canyon a few years ago, we purchased a stunning 500+ piece jigsaw puzzle for her as a souvenir. The image was an artist’s rendering of a view from the South Rim overlooking the Canyon at sunset. It was gorgeous! If you close your eyes, you can probably imagine what it looked like; however, I seriously doubt that you would attempt that puzzle without the box right in front of you. Most puzzlers refer to the picture on the box repeatedly to make sure they are headed in the right direction. So, what if I were to tell you that life is more like a box of puzzle pieces than a box of chocolates? It is. Not only do you “never know what you’re gonna get,” but neither will one bite help you figure it out! You just have to live it. One funky-cut piece at a time. It usually takes four-times longer to complete a 1,000-piece jigsaw puzzle as it does to complete a 500-piece puzzle. This is because each and every time you double the total number of pieces, you quadruple the challenge and difficulty. Before you begin a 4,000-piece puzzle, you need to take into consideration the fact that it’s going to take you 64 times longer to complete it than it would to successfully finish a 500 piece one! In other words, what feels like a pile of random craziness to us humans—who barely have an inkling what the final picture might look like—is, in reality, a strikingly complex and completely unique masterpiece cut with such precision that each piece locks perfectly into place with ease. Over time, we see more clearly how certain oddly-shaped pieces fit together to create an intricate pattern we almost missed! And when it’s all said and done, the final image should* closely resemble the picture on the box! Sometimes, when we’re in the middle of a challenging circumstance, we wonder if there is any rhyme or reason to it. God’s timing rarely matches our desired timing, and delays last decades. (Been there. Done that. Got the t-shirt.) We often struggle to uncover the method behind the madness or simmer internally with frustration until it finally, if ever, makes sense. What we must always remember—and never forget—is that our Creator is also our Provider. And though we typically experience God’s provision as something tangible (e.g., food, shelter, clothes, money, etc.) or spiritual (e.g., peace, love, joy, discernment, etc. ), His provision extends much further than that! The Lord also provides opportunities for us to acquire knowledge, learn new skills, and explore our world so that we are equipped to make a positive impact in it. He takes our everyday experiences—the good, the bad, and the ugly; the pleasant and the painful; the understandable and the mysterious—and uses them to equip and empower us to fulfill a specific-to-us purpose. Did you get that? He uses EVERYTHING, and in so doing, provides us with exactly what we need to do what we were created to do. What seems to be a thankless task at the age of 19 could end up being a necessary skill when turning 50. (Yes, I can testify to that of which I write.) We have to TRUST that our experiences—as mundane, ordinary, and/or frustrating as they may feel—are part of His sovereign plan for our lives. And what we perceive to be delays and detours often turn out to be key pieces of the puzzle which were strategically positioned to add depth, texture, and interest to our picture. In other words, our daily experience is a key aspect of God’s provision for us. In case you didn’t know, God’s philosophy is: No piece left behind! And then, there are the missing pieces—except they’re not really missing. They were stashed away in moments of sheer frustration when we could not see where they fit! Out of sight = Out of mind. But when the time is right, the Holy Spirit reminds us where we stored the “missing” pieces, and we can find and place them immediately…completing a part of the puzzle we hadn’t seen before. Yes, that’s right: There are puzzle pieces we haven’t received yet. Did I forget to mention that? Okay, so apparently, God keeps some pieces to Himself until it’s time for them to be placed. 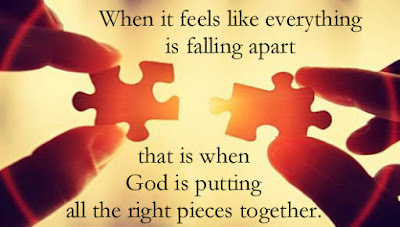 I think it’s for our benefit so that we don’t become overwhelmed by the unrecognizable patterns or discouraged by the enormous number of pieces still waiting to be placed. But in HIS perfect timing, these shiny new pieces arrive and fit perfectly—filling in a section upon we might have all but given up hope! Shiny and new, tattered and faded, formerly missing, and those not yet received—each puzzle piece contributes to the whole picture. It’s who we are, and eventually, with the Lord’s help, who we were always meant to be. * I say “should” because there are those who will inevitably reject the Puzzle Maker and His design, choosing instead to forge their own ways by tossing out pieces they don’t like; smashing together mismatched pieces; using glue to stick pieces together; and refusing to give the original plan a chance. Corrupt religious leaders have done this for centuries.